First snow of the fall/winter. Gill, Franklin Co., MA. October 28th, 2011. This light dusting did little to prepare us for an unprecedented snow event over the weekend. A small gathering of birders assembled at the Turner's Falls power canal this afternoon, waiting right up until dusk. Up to 350 Canada Geese were present at times, but the Pink-footed Goose never arrived resulting in some understandably disappointed faces. About a dozen Common Mergansers and 2 Hooded Mergansers did fly in towards dusk, but there was no obvious sign of a waterfowl roost. Greater Scaup - female, Barton Cove, Franklin Co., MA. October 28th, 2011. First of the fall here. 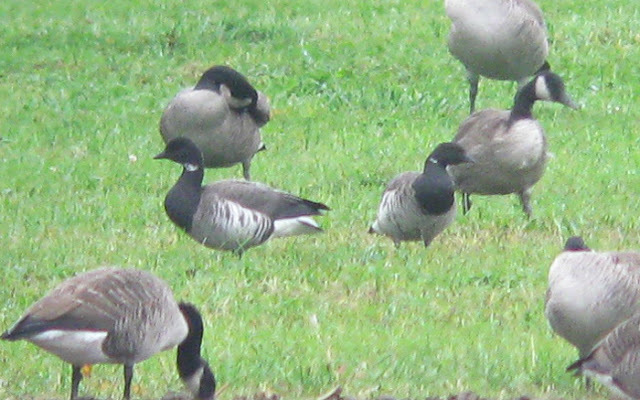 Mid-afternoon at Barton Cove was actually a little more productive with a Greater Scaup (my first of the fall), an adult Brant (different bird to the two at Gill yesterday), 5 remaining American Coots, 250 Canada Geese, 15 Ring-billed Gulls, and 5 high flying Red-tailed Hawks which may have been migrants. 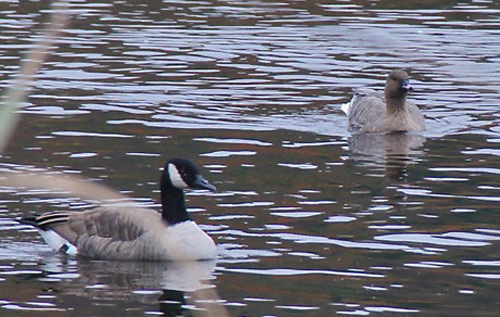 Brant - pale-bellied adult with (presumed) Atlantic Canada Geese (B. c. canadensis), Unity Park, Turner's Falls, MA. October 28th, 2011. 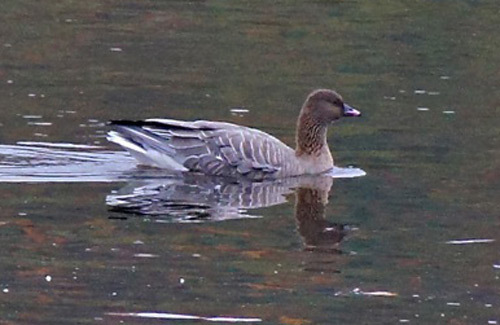 This morning (October 28th), I got another positive update on the Pink-footed Goose at the Turner's Falls power canal from Ellisa Rubinstein. Mark Taylor was already watching the bird at 07:45hrs when she arrived, affording 15-20 minutes of excellent views before it departed with just six Canada Geese. Elissa mentioned that the flock headed towards Deerfield so it would certainly scouring the empty cornfields in the greater Deerfield area. 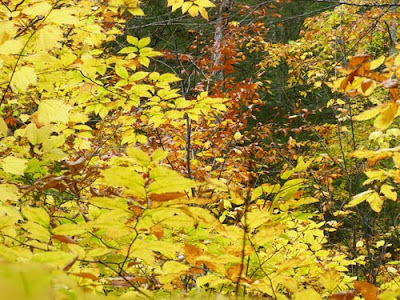 Deerfield is only a few miles south (slightly south-west) of Turner's Falls. Thanks very much to Ellissa for the positive report. BTW - No geese at all in the favored cornfield at Upinngil Farm this morning. MA - Brant, Coots, Ruddies and a Snow Bunting! Rain, drizzle, and later snow flurries all day long. Tough conditions to be out but definitely producing some interesting birds in Gill. Two Brants in the 'goose field' at Upinngil Farm were a pleasing find amongst 140 Canada Geese in the morning, and a quick of Barton Cove produced five American Coots, 5 Ring-necked Ducks and 2 Ruddy Ducks all off the public boat ramp. A late morning check back at Upinngil Farm found the Brants still present along with an increase to 400 Canada Geese, that's until a Bald Eagle flushed the lot with less than half the flock returning to the field. But, whilst waiting for more geese to arrive, a Snow Bunting flew over the field giving its delightful ringing calls - another nice arrival and my first of the fall. At home a bedraggled Northern Harrier flew low over the tree tops heading towards Gill center, and up to three Yellow-rumped Warblers remained in the yard. 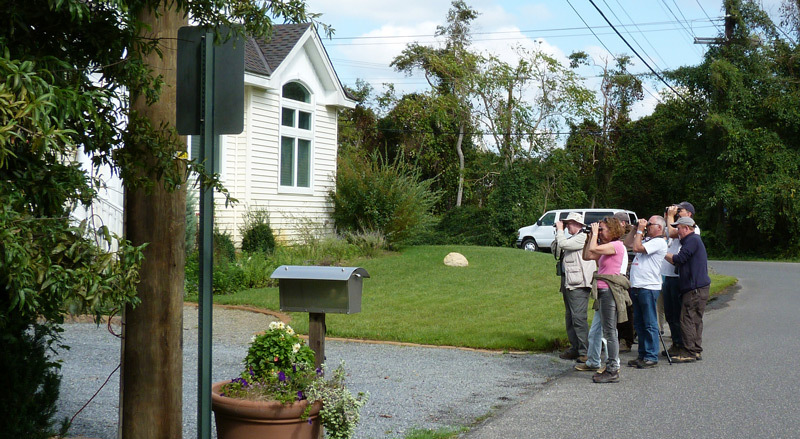 Also of note, a flock of about 100 Dark-eyed Juncos on Barney Hale Road - my first large flock of the fall. American Coot - Barton Cove, Gill, Franklin Co., MA. October 27th, 2011. Ruddy Duck - Barton Cove, Gill, Franklin Co., MA. October 27th, 2011. 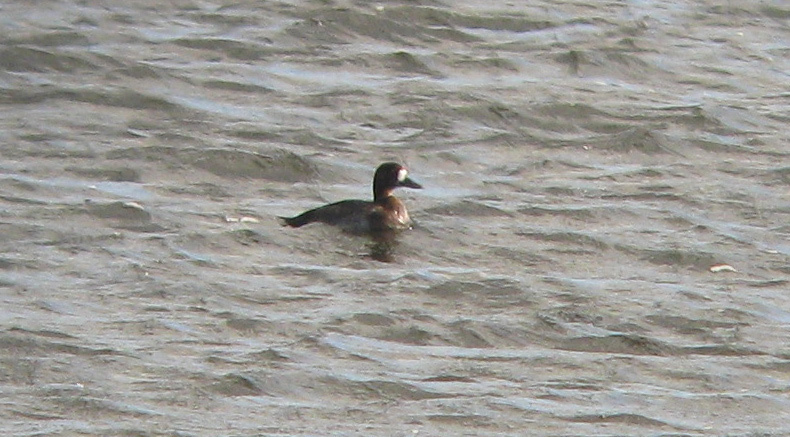 Ring-necked Ducks - Barton Cove, Gill, Franklin Co., MA. October 27th, 2011. Brant (B.b. hrota) - Gill, Franklin Co., MA. October 27th, 2011. As for the Pink-footed Goose, well it sounds like it eluded most of the birders that tried for it today, but I did hear of positive reports from the power canal in the very early morning and again late in the evening. 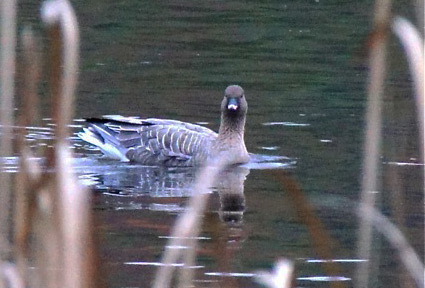 Fortunately Chris and Diane Fisher (the couple from Connecticut mentioned in my original post) found me through the internet and kindly sent along their images of the Pink-footed Goose, all taken on the evening of 10/26/11. These shots were taken from the bike path side of the power canal, and not Migratory Way. The images are superb and make a great contribution to the record. They appear here, along with a link to a Google Map created by Chris, with full permission. Thanks very much Chris and Diane! MAP of Turner's Falls including the goose viewing spots. 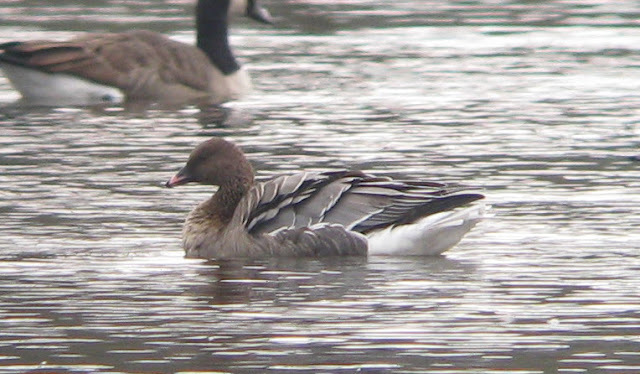 Pink-footed Goose - Adult, Turner's Fall power canal, Franklin Co., MA. October 26th, 2011. All images appear courtesy of Chris and Diane Fisher. Interesting shot at take off showing the striking blue-gray upperwing, and currently the only image we have showing the legs and feet. Thanks again to Chris and Diane for their fantastic contribution. Pink-footed Goose - Turner's Falls power canal, Franklin Co., MA. October 26th, 2011. Potentially the 4th state record if accepted by MARC, and the first in the Pioneer Valley. Smallish 'gray goose' with distinct blue-gray cast to the upperparts and well marked white fringes to the upperpart feathers indicating an adult. 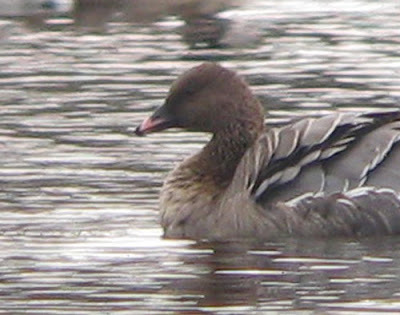 The short neck and small dark brown head, combined with the relatively short, pink-banded bill all point towards Pink-footed Goose, even without seeing the legs and feet! This afternoon I came across a Pink-footed Goose with a handful of Canada Geese on the power canal in Turner's Falls. My expectations were low as I arrived with perhaps less than 100 birds on the water. 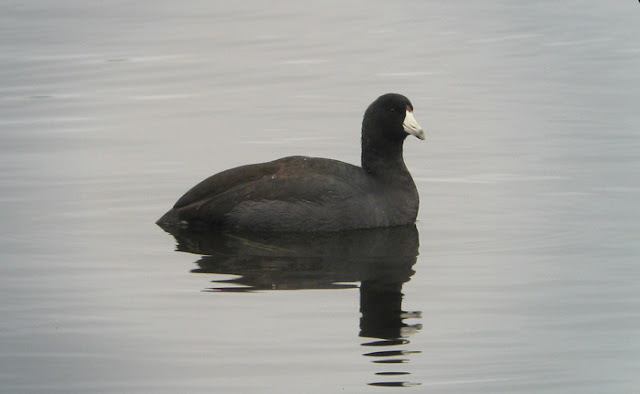 I'd also just arrived from Barton Cove which, aside from five American Coots found by Bill Lafley the day before, was eerily devoid of birds. My first two scans of the Canada Geese on the power canal yielded nothing of interest, but I set up my scope anyway and began a more thorough effort. 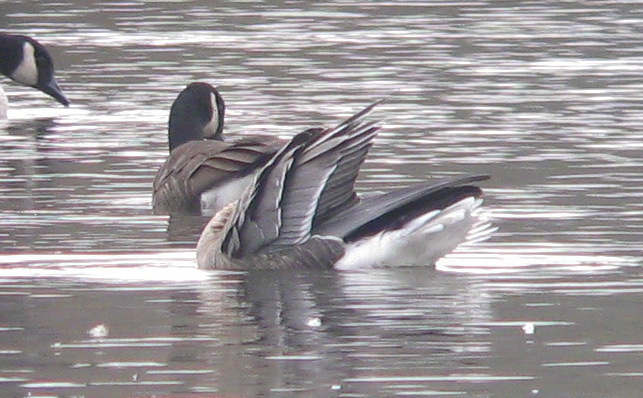 After going through two thirds of the flock, I picked up the frosty blue-gray upperparts of a 'gray' goose (Anser sp. 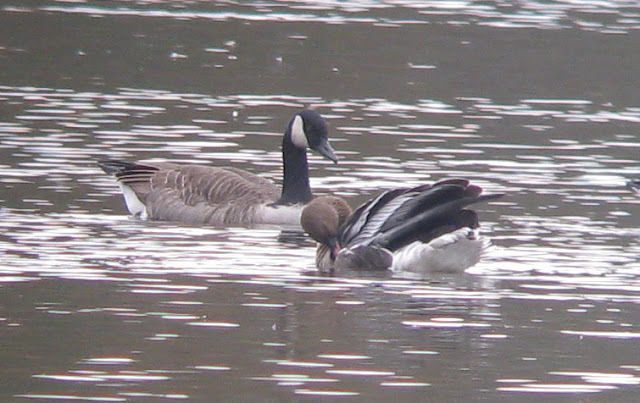 ), and as it lifted its head from preening, the dark brown head, short neck and pink band on the bill gave me all the information I needed - a Pink-footed Goose! Having seen rare geese suddenly take off and leave the power canal for no obvious reason, I first worked on getting as much photo-documentation as possible. A couple from Connecticut passing through the area on their way to Vermont arrived about 10 minutes later, and also spent time trying to get images - unfortunately I didn't get their names, nor did I see their results. The Pink-footed Goose remained in view, mostly hugging the bike path side of the canal, until I had to leave to pick-up Matan from nursery school at 15:45hrs. The couple from CT may have moved around to the bike path side to get better images as I was leaving, though I don't know if they succeeded. 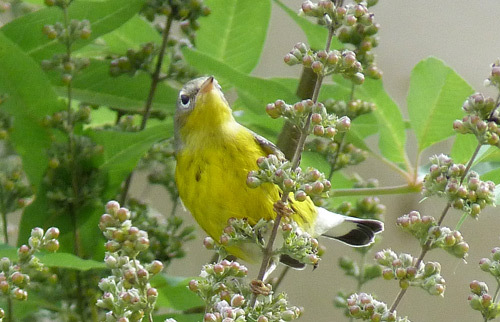 Provided this bird is accepted by the Massachusetts Avian Records Committee, it should become the 4th state record and the first in the Pioneer Valley. Two other Massachusetts records come from Cape Cod, and there was a third which spent some time the Concord/Acton area in late fall/early winter 2010. 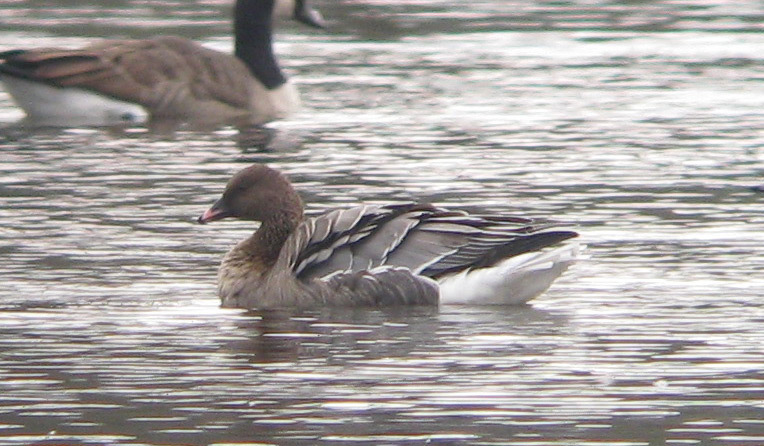 Some images of that individual can be seen here; Concord Pink-foot Dec 25th, 2010. 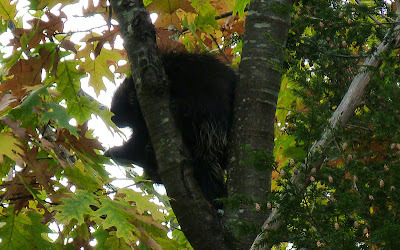 All the images below relate to the Turner's Falls bird, taken on October 26th, 2011. 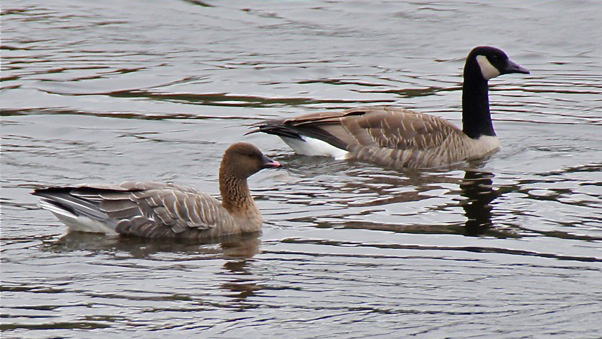 Pink-footed Goose - spent virtually the whole time preening. 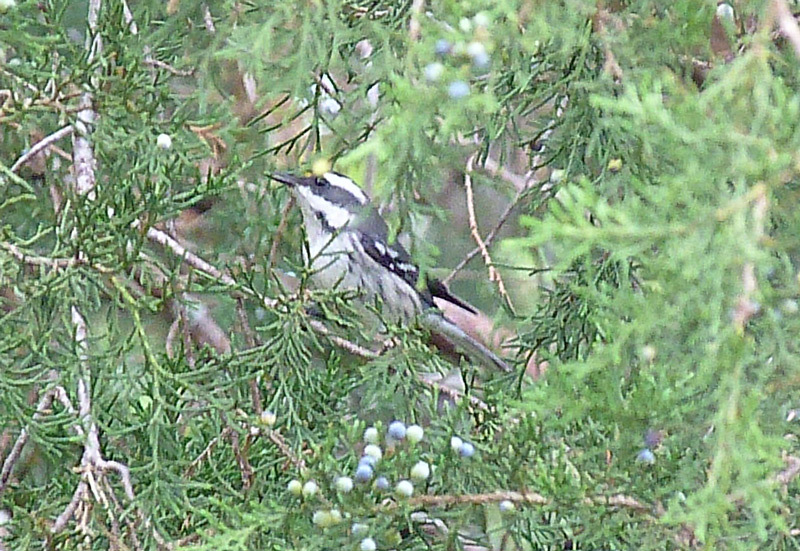 Showed the blue-gray upperwings well several times, but this was the closest I got to an image. North American Porcupines - Warwick State Forest, Franklin Co., MA. October 23rd, 2011. On Sunday we enjoyed a family walk along the lower slopes of Mount Grace in Warwick. The trail we chose, actually part of the Metacomet-Monadnock Trail, was rather quiet bird-wise but got a little more exciting when we came across not one, not two, but three porcupines all feeding in the same Eastern Hemlock! 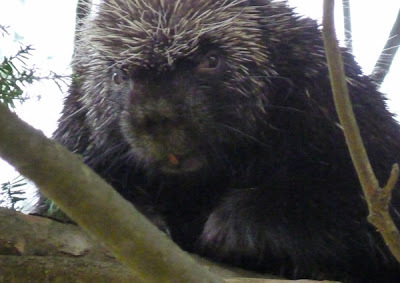 Two of them even got into a confrontational dispute resulting in some very weird, eerie squeals ringing around the forest. 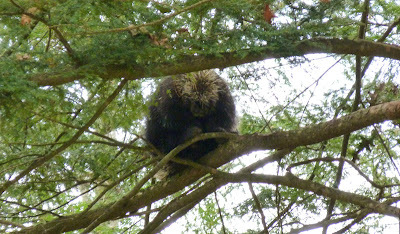 Close by, a juvenile Yellow-bellied Sapsucker fed during the whole time completely unconcerned as we clambered through the undergrowth to get better views of the porcupines. Perhaps it's just coincidence but I can recall at least two other ocassions where I've found sapsuckers feeding close to porcupines. 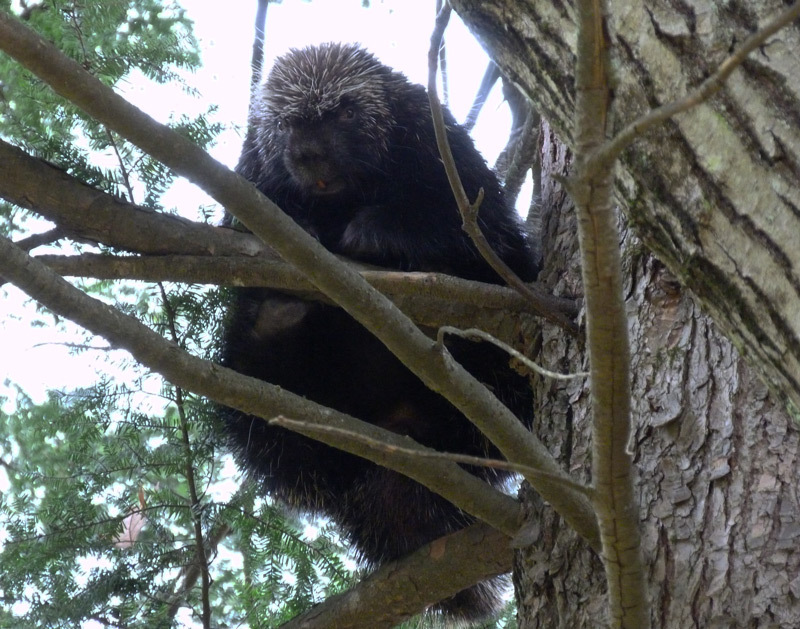 Both of those sightings came from the Prescott Peninsula in the Quabbin watershed. Yellow-bellied Sapsucker - juvenile, Warwick State Forest, Franklin Co., MA. October 23rd, 2011. 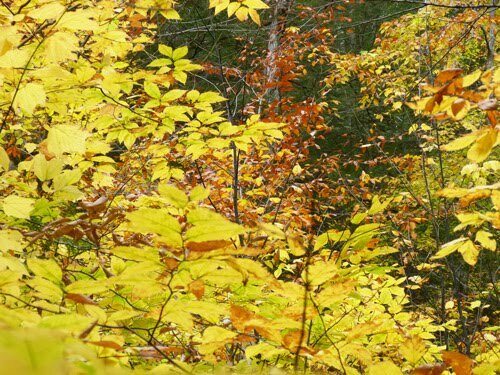 Foliage along the Metacomet-Monadnock Trail. Hermit Thrush - first-winter, presumably of the Eastern race C. g. faxoni. Gill yard, Franklin Co., MA. October 24th, 2011. This morning's damp, cold, foggy dawn was enlivened by the calls of Hermit Thrushes along Main Road in Gill. Several birds were heard in flight and may have been disoriented by the fog. The birds were clearly audible giving soft but piping 'peew' calls. I must have heard 6 - 8 individual birds. 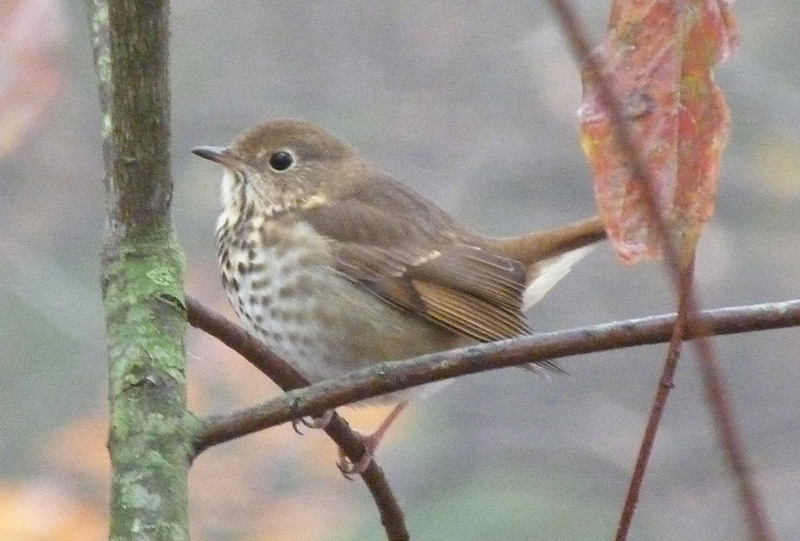 After dropping Matan at nursery school, I came home to find a Hermit Thrush calling ( a weezy 'rheeee' and plus 'chup' calls) right outside the kitchen window! 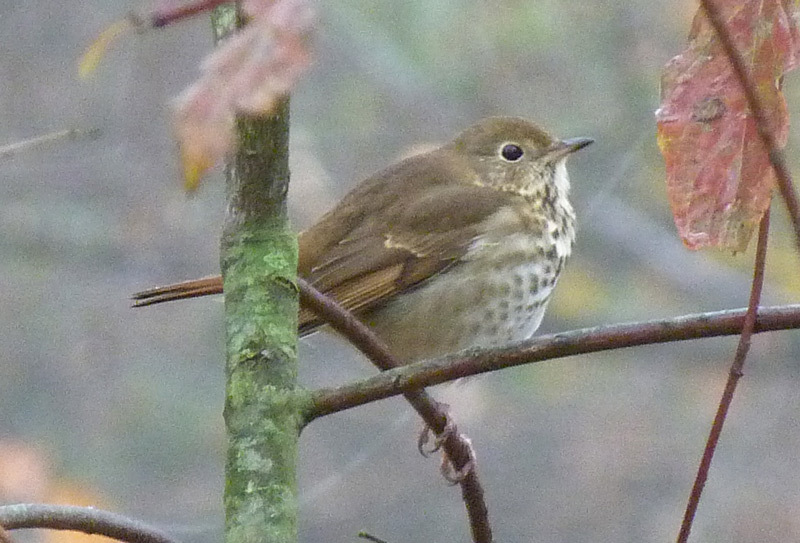 It was a feisty first-year bird allowing for a close approach and some nice pics in the morning fog. 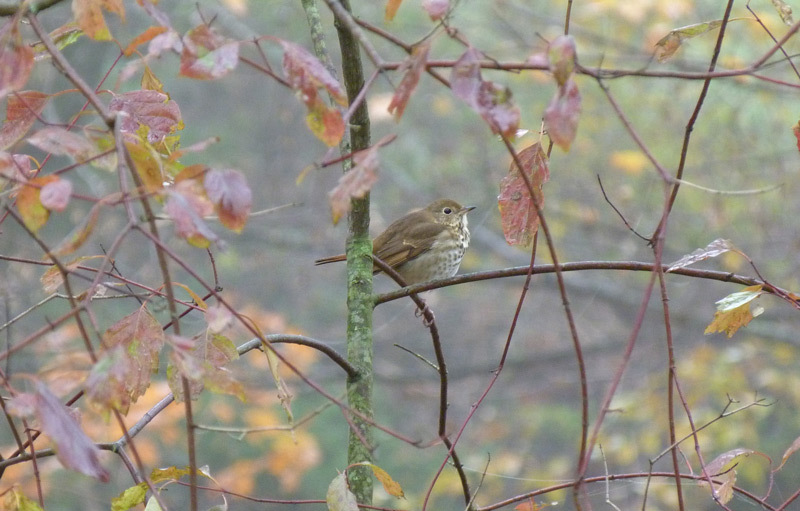 No other Catharus thrushes heard this morning after last week's Swainson's Thrush influx. Also in the yard today, a singing and calling Carolina Wren, the first that we've had in months. 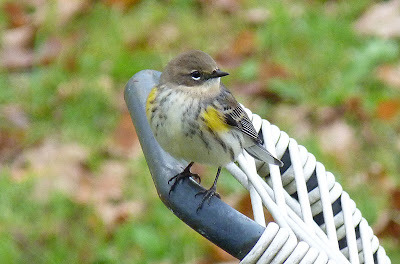 Yellow-rumped Warbler - getting comfortable in the yard. It's been a great week for these with up 25 around the homestead on most days. The bulk will have moved south by early November. Gill, Franklin Co., MA. October 19th, 2011. Gill - Another terrific week for local incidental sightings. Great Horned Owls have been vocal on several mornings this week predawn being the best time to hear them. 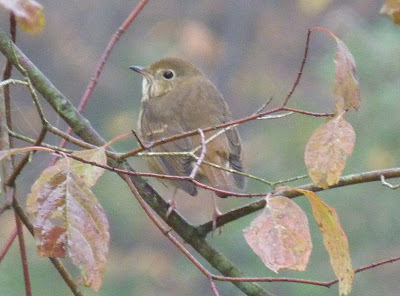 The 'event' of the week was a mini fall-out of Catharus thrushes on Oct 19th along Main Road, with Swainson's Thrushes (6) and a Gray-cheeked Thrush frequenting the yards and woodland fringe at dawn, but also including a nice Swainson's in our yard in mid-morning. 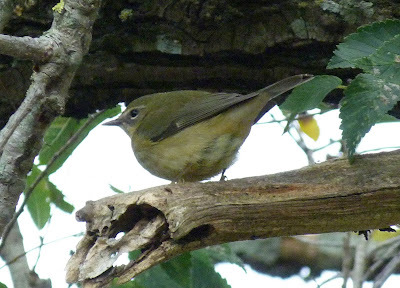 The following day saw 4 Swainson's, again birds calling at dawn and likely birds left over from the previous day. October 21st had singles of Swainson's, Gray-cheeked and Hermit Thrushes calling at dawn from yards on Main Road. Northern Harrier - first-winter migrating over our yard in Gill. Franklin Co. MA. October 17th, 2011. Our yard has seen some fantastic feeding flocks consisting mainly of Yellow-rumped Warblers (20+), Eastern Bluebirds (8), Ruby-crowned and Golden-crowned Kinglets (2 of each), and surprisingly, Chipping Sparrows with up 20 occasionally dropping down onto the lawn to feed. 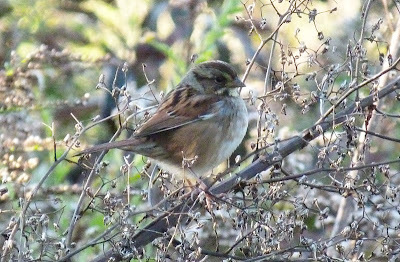 After last week's post, Swamp Sparrows have been a permanent feature in the weedy tangles around the vegetable plot with up 8 present at times. 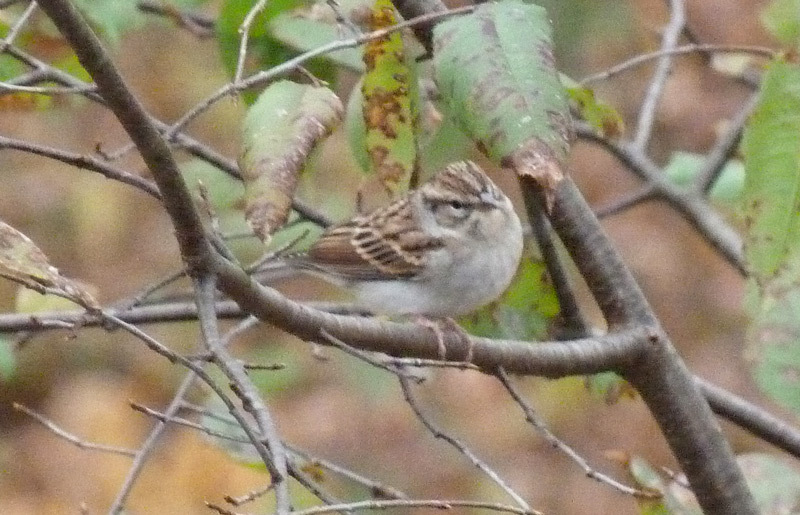 Chipping Sparrow - Gill yard, Franklin Co., MA. October 17th, 2011. Swamp Sparrow - Gill yard, Franklin Co., MA. October 17th, 2011. Interesting ' fly-over' migrants included another Northern Harrier (Oct 17th) and an American Pipit (Oct 18th) with Canada Geese commuting everyday between Gill's fields and the CT River at Barton Cove. 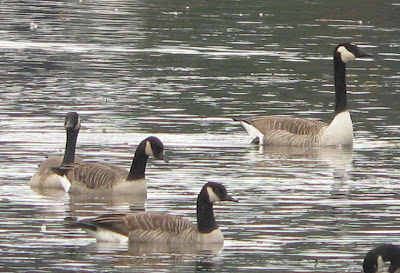 Despite regular checks, I never did relocate the putative 'Taverner's' Cackling Geese from Oct 14th but on Oct 19th and 20th, there was a large Canada Goose closely resembling the maxima subspecies - 'Giant' Canada Goose. 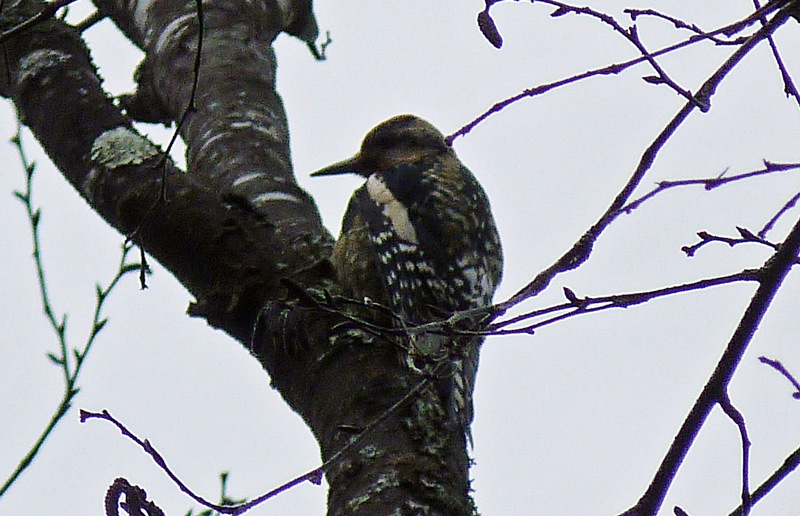 This bird was seen both at Upinngil Farm and Barton Cove. 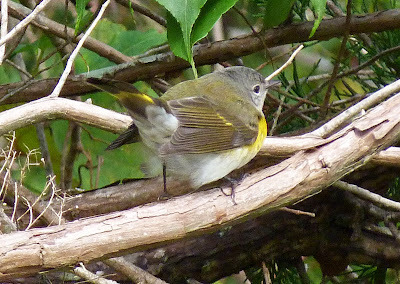 A few late/lingering migrants in the yard included an Eastern Phoebe and a Blackpoll Warbler on the 17th, Palm Warbler on the 18th, a Gray Catbird on the 20th and up to 2 Common Yellowthroats through to the 21st. Ring-necked Ducks - Turner's Fall power canal, Franlin Co., MA. October 16th, 2011. 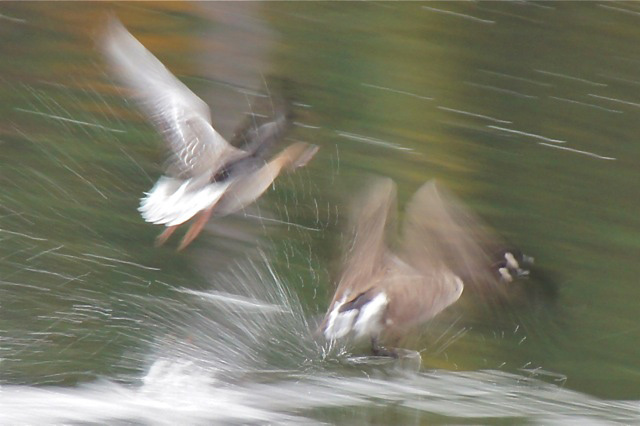 Despite several visits, Barton Cove and Turner's Fall power canal have been slow for waterfowl with only a Hooded Merganser and 5 Ring-necked Ducks last Sunday (Oct 16th). Finally, Oct 17th produced the first calm evening for days which seemed liked a good cue to try a few local plots for Northern Saw-whet Owls. I tried three areas coming away with nothing definitive but did have possible contacts in two plots. All three spots produced saw-whets last fall/winter. Doubtless, I'll be trying again next week! Palm Warbler - possibly a dull Eastern showing a weak yellow wash on the underparts, but I decided to leave this one unidentified as it looked quite pallid and washed out at times, more closely resembling a Western Palm Warbler. This morning I had good views of a very large Canada Goose at Barton Cove, Gill. It showed a number of characteristics that I've come to associate with B.c. 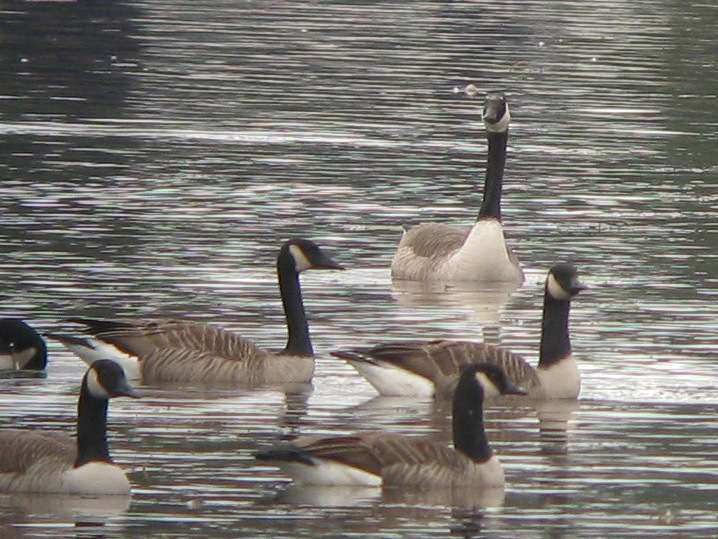 maxima - 'Giant' Canada Goose. 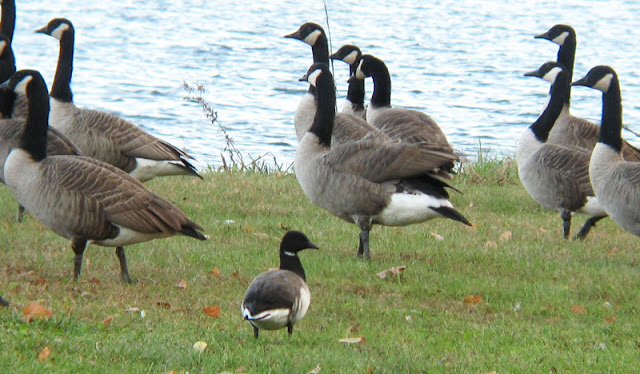 Giant Canada Goose could be a regular (but rare) fall migrant through the CT River Valley where I've detected birds resembling this form annually since 2006. 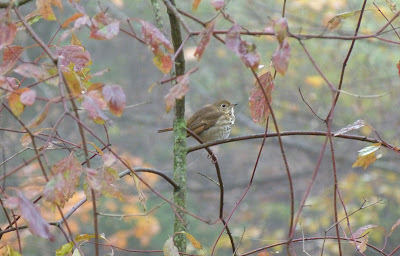 I also recall Marshall Iliff photographing a similar bird in Concord, MA a couple of years ago, also in October. 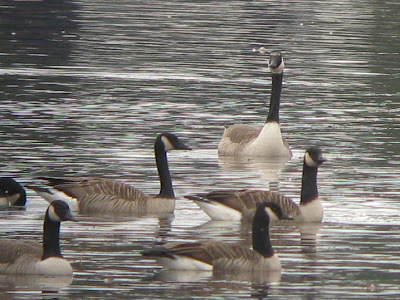 probable 'Giant' Canada Goose (B. c. maxima) - subject bird at the upper right of the image, Barton Cove, Gill, Franklin Co., MA. October 20th, 2011. The same bird was also present in the 'goose field' at Upinngil Farm on Main Road, Gill, yesterday, October 19th. 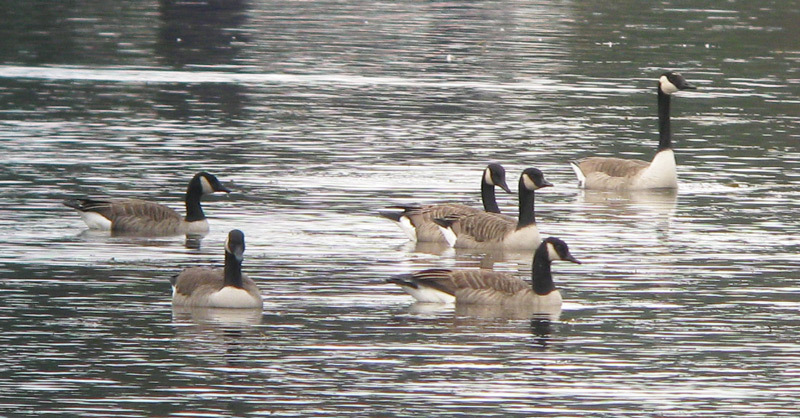 1) Obviously very large in direct comparison to surrounding Canada Geese (likely B. c. canadensis and B. c. interior). Looked massive and much more 'stately' at all times. 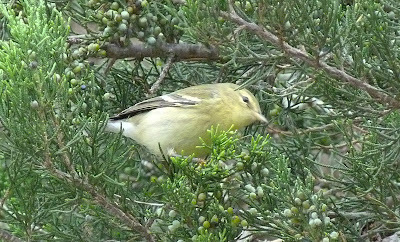 2) Much larger white cheek patch than surrounding birds, especially at the upper rear of the cheek resulting in more visible white wrapping around towards the nape. Also notable, uneven amounts of white flecking across the forehead forming a near complete band. This, combined with the broader expanse on the white cheeks created a much 'whiter-headed' impression visible at considerable range. 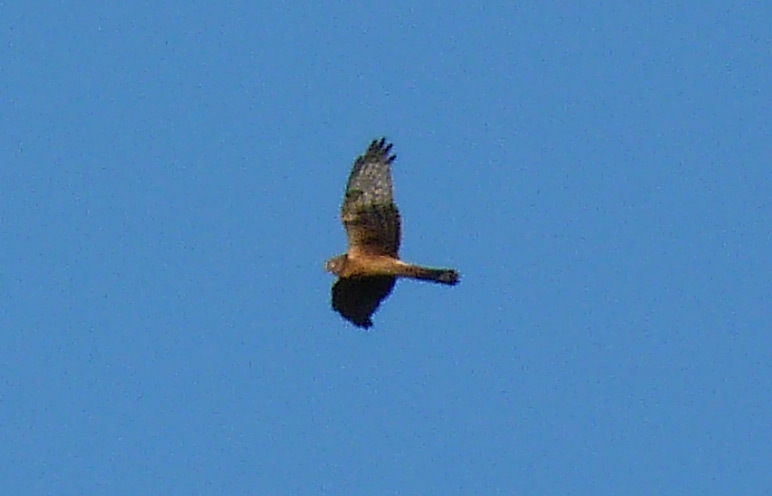 3) Very white breast, and overall paler cast to the underparts and flanks. 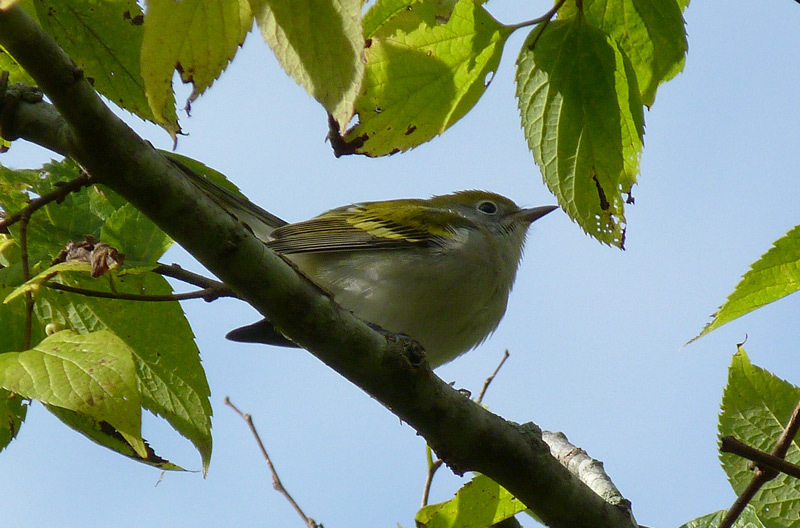 4) Slightly paler cast to the upperparts. 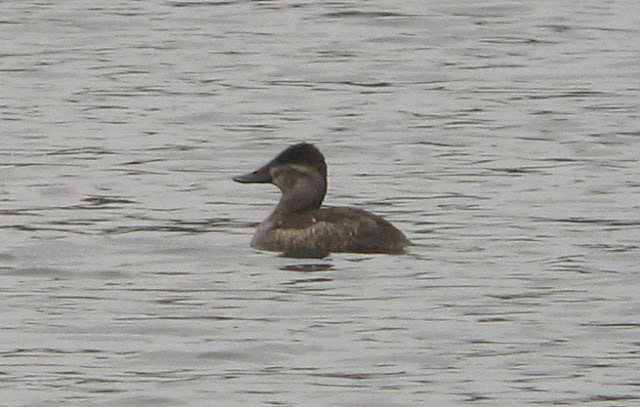 5) Looked curiously flat-backed in the water, especially when swimming in direct comparison to canadensis/interior. This may have been posture related but it was interesting to compare to the more hunched of appearance canadensis/interior. 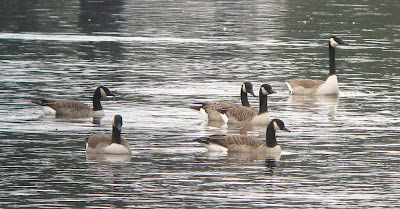 probable 'Giant' Canada Goose (B. c. maxima) - subject bird again at the upper right of the image, Barton Cove, Gill, Franklin Co., MA. 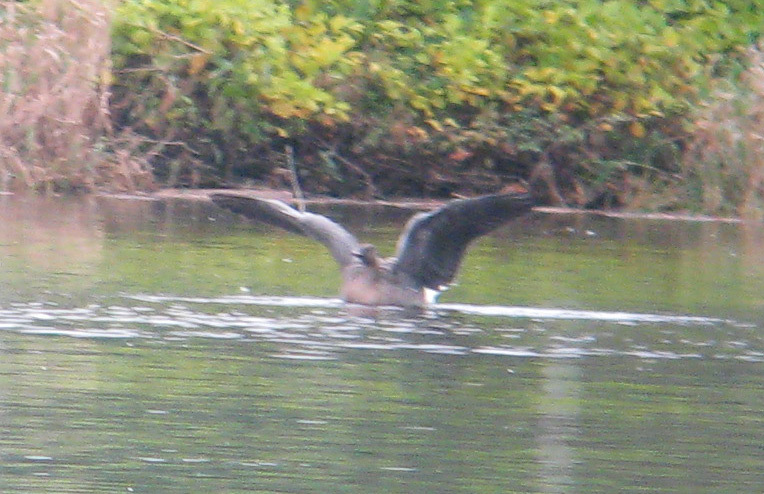 October 20th, 2011.
probable 'Giant' Canada Goose (B. c. maxima) - subject bird at the rear of the image, Barton Cove, Gill, Franklin Co., MA. 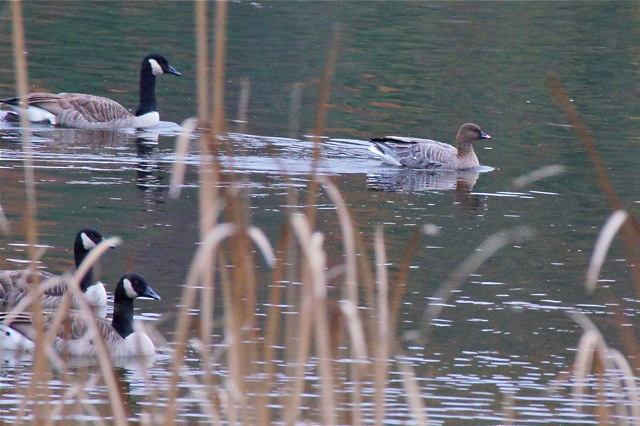 October 20th, 2011.
probable 'Giant' Canada Goose (B. c. maxima) - subject bird at the front left of the image, Barton Cove, Gill, Franklin Co., MA. 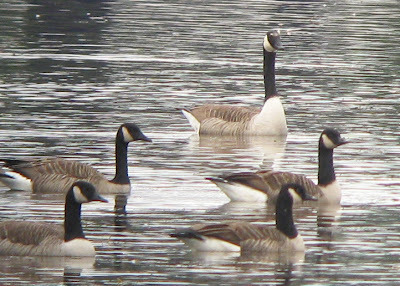 October 20th, 2011.
probable 'Giant' Canada Goose (B. c. maxima) - subject bird at the rear center of the image, Barton Cove, Gill, Franklin Co., MA. 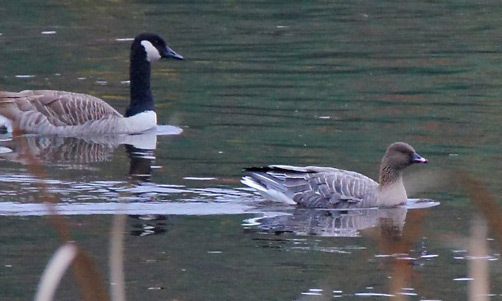 October 20th, 2011.
probable 'Giant' Canada Goose (B. c. maxima) - subject bird at the rear of the image, Barton Cove, Gill, Franklin Co., MA. October 20th, 2011. Frontal view shows near complete but uneven white band across the forehead. 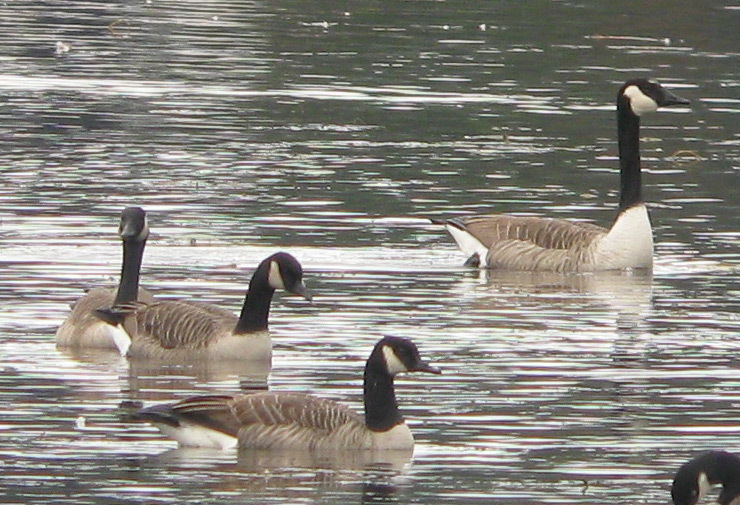 Posted with the understanding that subspecies of Canada Geese may not be identified with certainty in the field. 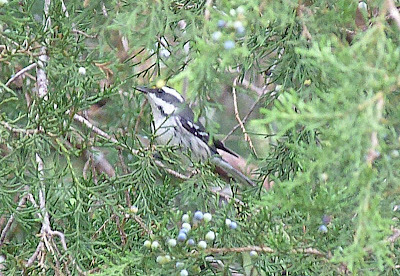 Black-throated Gray Warbler - female, Higbees fields, Cape May, NJ. September 29th, 2011. Found by visiting Brit, Jonathan Wasse on his first morning at Cape May, and apparently only about the sixth record for Cape May! 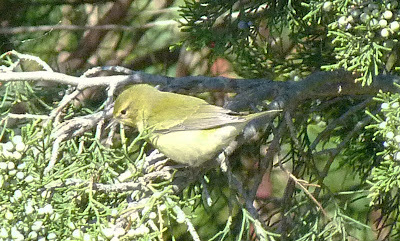 Magnolia Warbler - first-winter, Cape May Point, NJ. October 1st, 2011. 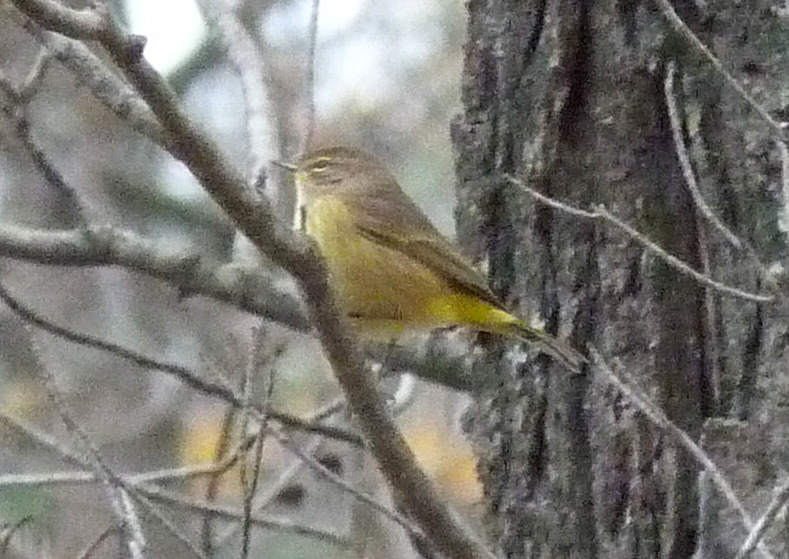 Tennessee Warbler - first-winter, Cape May State Park, NJ. October 1st, 2011. Chestnut-sided Warbler - first-winter, Higbees fields, Cape May, NJ. October 2nd, 2011. 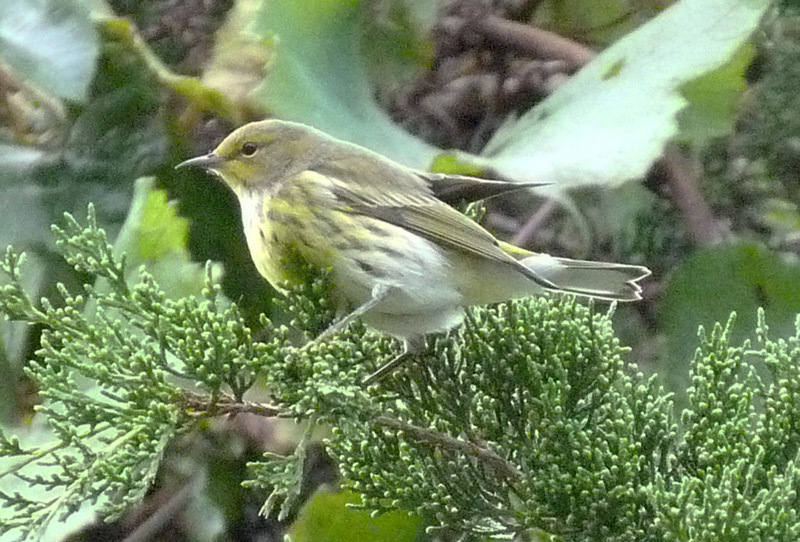 Cape May Warbler - Cape May Point, NJ. October 1st, 2011. Black-throated Blue Warbler - first-winter female, Cape May Point, NJ. October 1st, 2011. 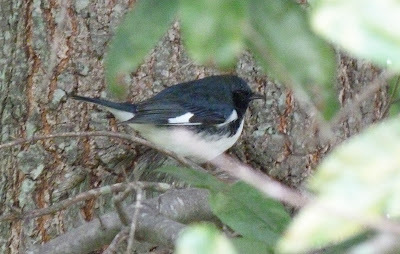 Black-throated Blue Warbler - male, Cape May Point, NJ. October 1st, 2011. 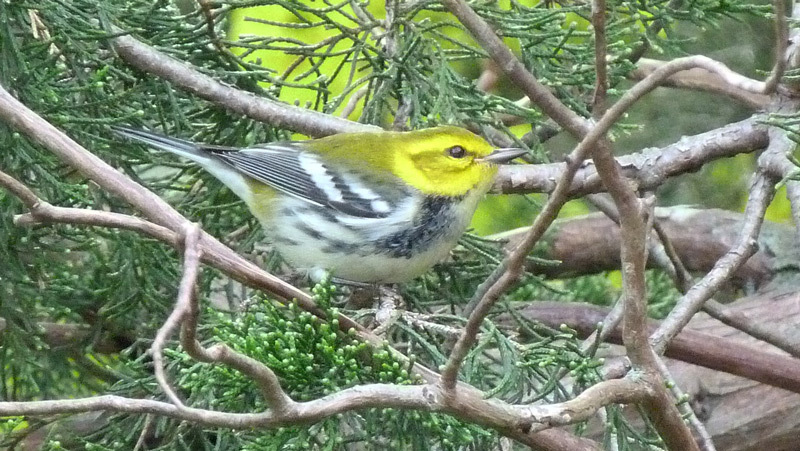 Black-throated Green Warbler - Cape May Point, NJ. October 1st, 2011. Blackpoll Warbler - first-winter, Cape May Point, NJ. October 1st, 2011. American Redstart - first-winter/female, Higbees fields, Cape May, NJ. October 2nd, 2011. Brits enjoying their warblers (Nashville and Black-throated Blue) at Cape May.